Join this mad patrol of Italian metallers where drinking beer, slamming into the pit and showing your passion for heavy music are the only rules you need to follow. Forged in the distant year of 1991 in the metallic pits of Padua, a city in Northern Italy’s Veneto region, Italian Heavy/Thrash Metal squad Mad Agony went on a huge hiatus starting in 1993 due to the departure of one of its founding members, but their inner passion for true heavy music didn’t die at all, leading the band to rise from the ashes in 2011. After their rebirth to the world of heavy music, the band released in 2013 the full-length album Chernobitch, gaining positive feedback from fans and critics worldwide and, consequently, inspiring them to keep recording heavy music in the following years, culminating now in 2018 with the release of their second full-length installment, titled Mad Patrol. Comprised of “Mad” Max Zane on vocals, Samael Von Martin on lead guitar, Andrea “Babetz” Babetto on rhythm guitar, Dani D3vine on bass, and Demian De Saba on drums, Mad Agony play a wild and straight-to-the-face fusion of several styles such as Heavy Metal, Trash Metal, Hard N’ Heavy, Hard Rock and even Black Metal, with their songs being characterized by endless amounts of electricity and being highly recommended as the playlist for any fun rock n’ roll party where drinking all the beer you can until you drop is mandatory. Put differently, Mad Agony don’t aim at reinventing the wheel with Mad Patrol, but just to keep partying and carrying the flag of Heavy Metal proudly in honor of the golden years of the music we all love so much. The headbanging riffs by Samael and Andrea rev up the engines in the opening track Cold Stars, an old school fusion of the classic Thrash Metal played by Anthrax with the more visceral music blasted by Forbidden where Mad Max lives up to his own nickname with his rabid screams, and with the music ending powerfully with a flammable solo by Samael. Then crushing guitar lines kick off an epic and impactful ode to Thrash Metal by Mad Agony, titled Circle Of Fire, also bringing hints of the Power Metal played by bands like Grave Digger and Running Wild and, consequently, being highly recommended for admirers of 80’s traditional metal music; whereas in Let Me Die we’re treated to a mid-tempo sonority showcasing rumbling bass punches by Dani and steady, fierce beast by Demian, with its rhythm reminding me of the classic “Bang Your Head” by Quiet Riot. It gets a bit tiring after a while, though, but nothing to worry about. More Beer is one of those old school thrashing hymns with a beyond fun theme, with the whole band destroying their instruments during the faster pieces, while the slower parts are spearheaded by the slashing riffs by Samael and Andrea; followed by Party Time (Zombie Version), a Rock N’ Roll party by Mad Agony where Mad Max couldn’t sound more inspired on vocals while Samael fires pure awesomeness through his riffs and solos. And in Warriors Of The Whales, which by the way has an amazing name, the vocals by Mad Max sound somehow inspired by the great Udo Dirkschneider, becoming an awesome option for slamming into the pit during their live performances, with Demian being utterly brutal on drums. Antiochia – Back To Bare Metal is a classic instrumental Heavy Metal extravaganza showcasing potent drums and electrified guitar riffs and solos, before Mad Agony get back to a more Rock N’ Roll and Hard Rock vibe in the flammable You Bring Me To The Ground. Simply grab your beer, slam into the pit and have fun with this exciting tune, with highlights to its catchy chorus and the exciting pace led by Damien and his solid beats. And lastly, we have Metal Thrashin’ Mad, their cover version for the classic by Anthrax from their 1984 album Fistful Of Metal (check out the original version HERE). Needless to say, Mad Agony’s version is just as incendiary, entertaining and old school, with the demented vocal performance by Mad Max being the icing on the cake. 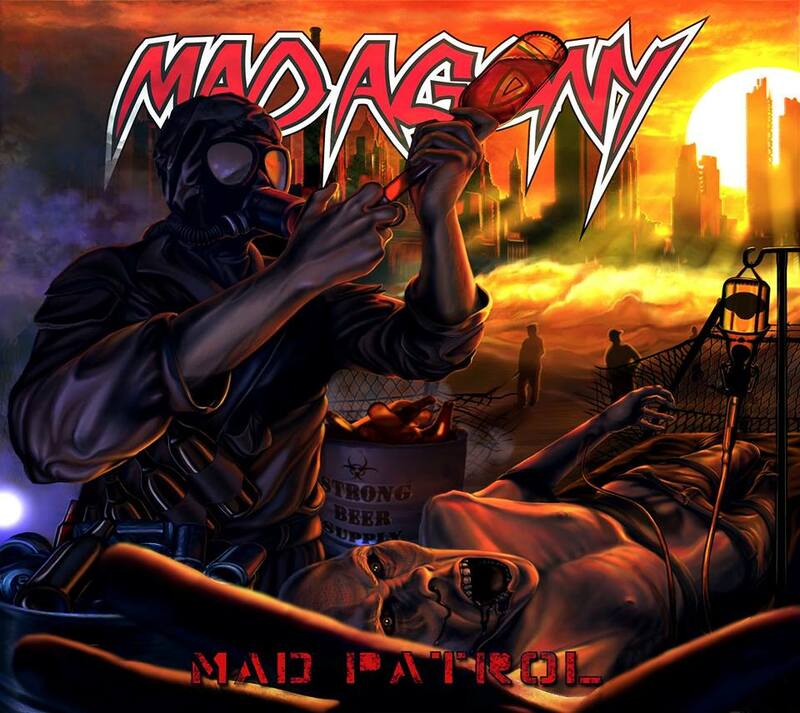 You can get more details about Mad Agony and their unrelenting metal music through their official Facebook page, and purchase your copy of the well-crafted and upbeat Mad Patrol from the band’s own webstore (where you can buy the way buy the special edition with a bonus live CD) showing your support to such obstinate band and, as a consequence, keeping the flame of underground metal burning brighter than ever. And besides, how not to be tempted to join a “mad patrol” of Heavy Metal? You have to be really mad not to take part in such distinct squad. Best moments of the album: Circle Of Fire, More Beer and Metal Thrashin’ Mad. Worst moments of the album: Let Me Die. This entry was posted in 2018 New Releases and tagged "mad" max zane, andrea "babetz" babetto, anthrax, black metal, dani d3vine, demian de saba, hard n' heavy, hard rock, heavy metal, mad agony, mad patrol, metal thrashin' mad, more beer, padua, power metal, rock n' roll, samael von martin, trash metal, veneto by Gustavo Scuderi. Bookmark the permalink.